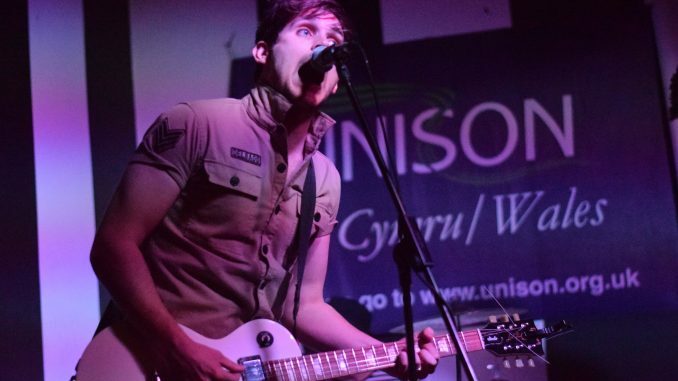 Tredegar’s six legged The Sandinistas continued their rise to the top with a blistering set for young members of UNISON, the union for public service groovers, in Cardiff’s Ten Feet Tall. 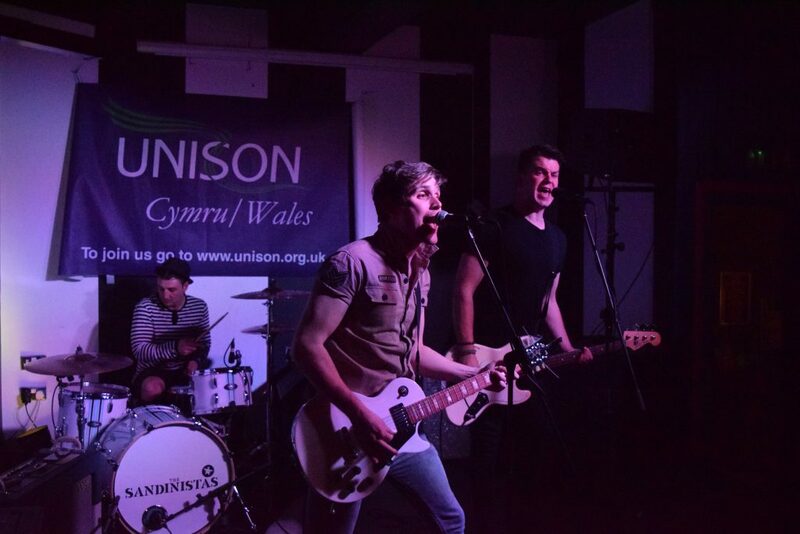 Fresh from playing South by Southwest in Texas and string of sold out shows in the UK, the Sandinistas showed they have not forgotten their roots by playing the launch party for UNISON Cymru Wales’ Charter for Young Member’s. They may stand like the Clash, walk like the Clash and be named after a Clash album (or maybe the South American rebels), but their music is fresh and original, taking only the energy and enthusiasm from the Clash sound. With high octane guitar laid over machine gun drumming and menacing bass, they lay down a sound that has enough punk sensibility to remind the older members of the crowd of their youth. But they also have a clean sophistication to their sound that will entertain the younger audience, who demand more than the three chord wonders of the past. They tore through their set with confidence and swagger, but still found time between numbers to interact with the audience and big up the cause they had come to promote. As they put it, ‘You can’t spell UNISON, without U and I’. They had the gathered masses gyrating and smiling from ear to ear; from their tyre smoking start, through their ‘Ready to Blow’ single, right up to the end of the set. The problem with being in a new band is that you can get caught out. If you blow your entire repertoire of songs in your main set, what do you do when the crowd demand an encore? Well in this case, we were given Johnny Cash’s ‘Folsom Prison Blues’ – on steroids. 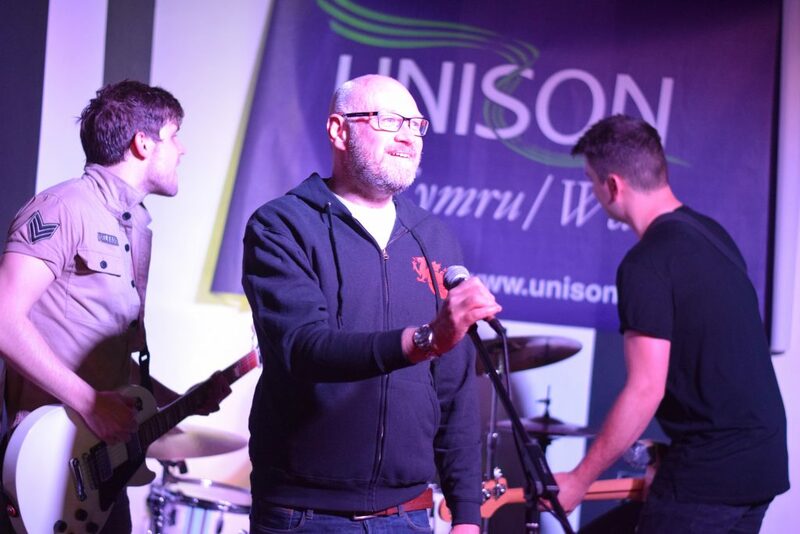 Then, by way of punishment for Mark Turner of UNISON for trying to be a young member, he is dragged up on stage to give us a rendition of the Undertones ‘Teenage Kicks’. Watch out for the Sandinistas when they play Merthyr Rising 26th to 28th May, the festival sponsored by UNISON. You never know, Mark Turner might be up on stage again – he has got a month to actually learn the words! Young workers are being disproportionately hit by the UK Government’s unnecessary austerity policies. Young people’s deteriorating prospects are due to a toxic combination of increased university tuition fees, unemployment, poorer job opportunities, lower pay and rapid house price inflation. The idea of the campaign is that whilst we think the demands within it should be law, employers have an obligation to their young workers now. We are therefore asking employers to sign up to the Charter’s 5 pledges.